I simply can’t believe it’s September 1st today. In a couple of days, my girls will head back to school and at the end of the month, it’s time for Knit City… and it honestly feels like yesterday that I was just at Knit City…not that a year has passed already! Time just doesn’t seem to slow down for anything these days! When I was searching through our photographs for this month’s colour inspiration, I was struck with an idea. What if I chose colours from a photograph that weren’t as obvious as one might initially see… would it change the look and feel of things? Would it make it more challenging for me to create a palette I was happy with? Would it make it harder for people to see my inspiration? Ultimately, I decided it was worth a shot, so that’s exactly what I did this month! 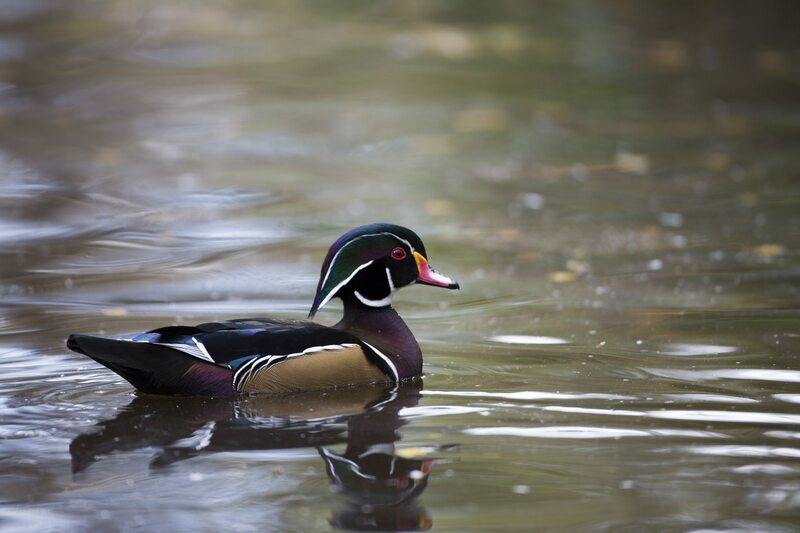 My inspiration this month was this photograph Eric took of a wood duck. The initial colours I see are the deep, rich jewel tones. 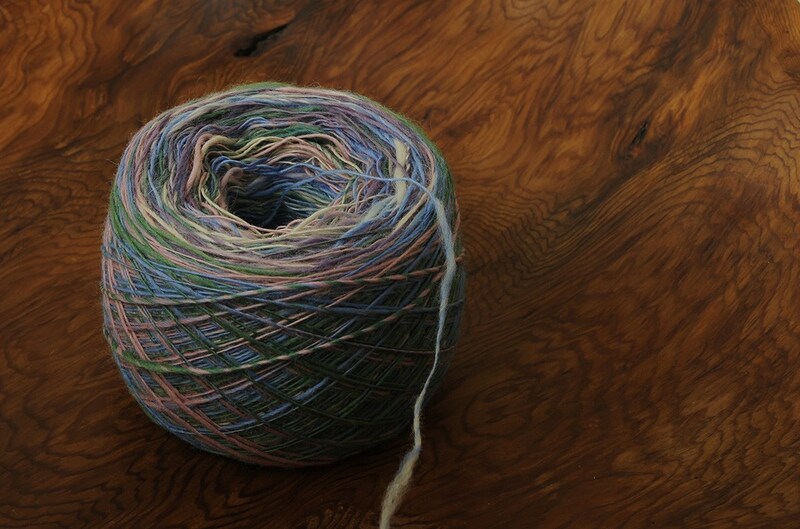 However when you start to examine the photograph a little closer, you can see a few of the lighter colours I ultimately chose for the fibre. The light blue is the colour just barely visible on the wing, the pink is in his beak close to where the light is reflecting, the green and purple are from his feather colouring, and finally the very light caramel colour is from the feathers on his wing. I’ll be honest, this wasn’t my favourite month in how the colours turned out, but it was an interesting challenge for me to look a little deeper to see what I could find! 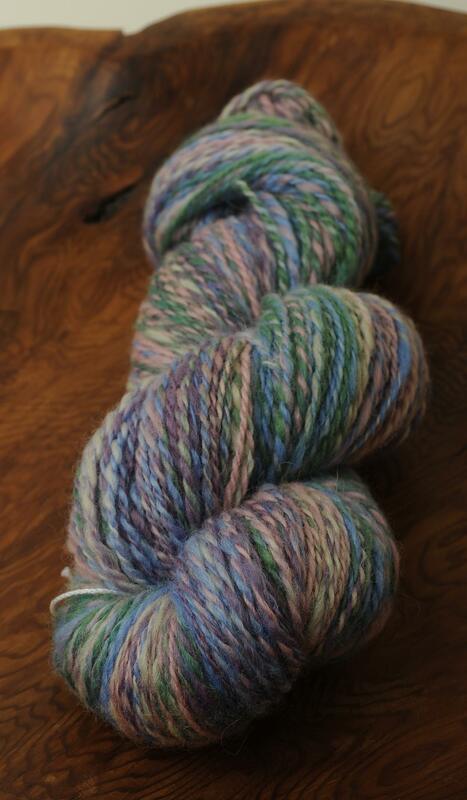 Basic club this month was 100% BFL and Luxury was a blend of 75% BFL/25% Tussah Silk. My set this month was basic club and I had a lot of fun spinning it. 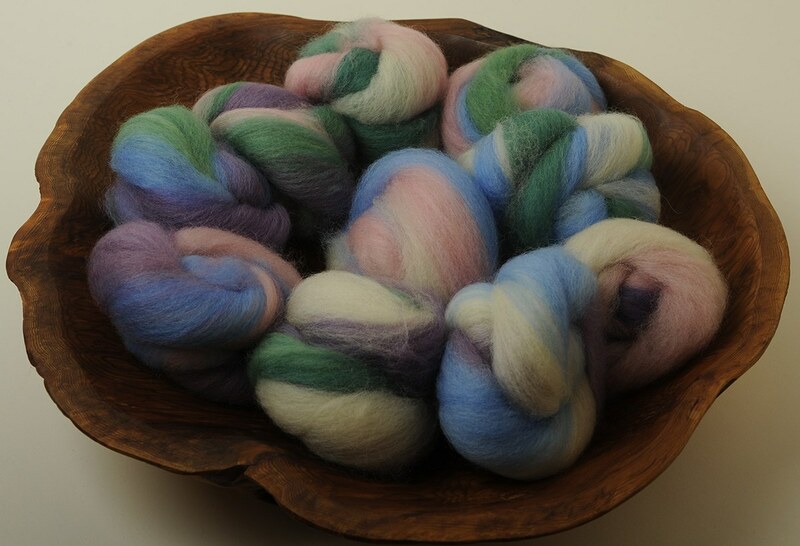 I opted to spin each bump in succession and then ply from a center pull ball. When I was spinning each bump, I worked my way back and forth along the top. Effectively this was creating little tiny stripes of each of the colours. I also arranged my battlings in such a way that I alternated between ones that had green in them and ones that didn’t. This was my ball ready for plying. 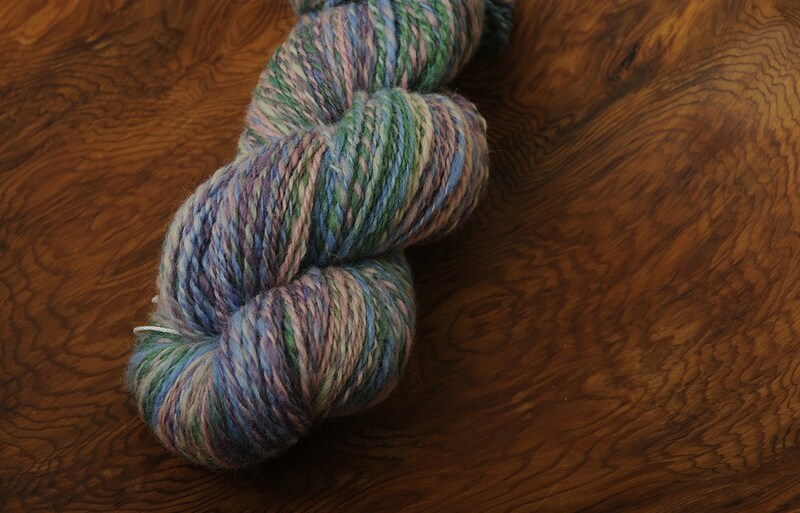 As you can see there was a lot of barber poling on the yarn, but there were also several places where the same colours lined up. This actually surprised me a little bit! 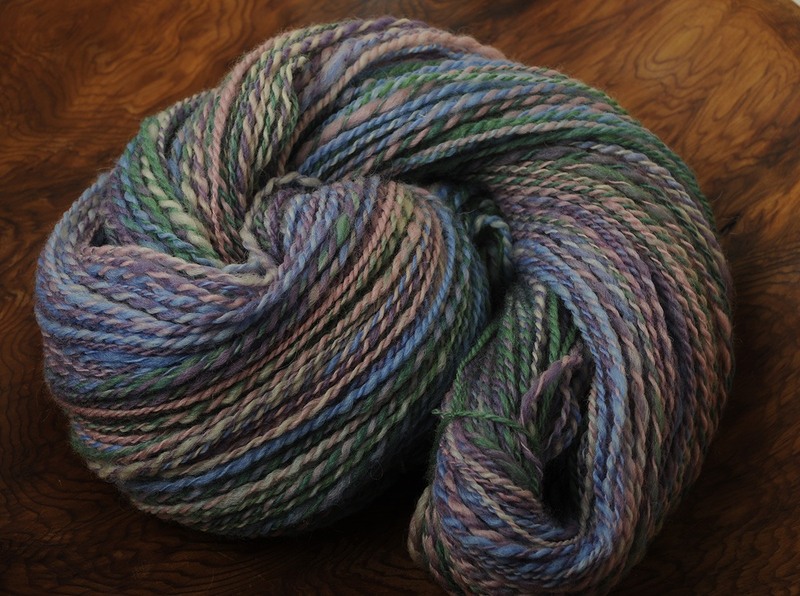 Overall, I’m pleased with how my yarn turned out, even if I wasn’t as happy with my initial colours. I will likely try this experiment again in the future, just because I think it’s important to try new things and expand our comfort zone.